Good morning. It's Thursday, Nov. 8. • A gunman kills 12 people at a country bar in Thousand Oaks. • Two G.O.P. seats fall to Democrats in Southern California. • And self-help as a pathological pursuit in Los Angeles. An F.B.I. agent spoke to a witness near the scene of a mass shooting in Thousand Oaks early Thursday. 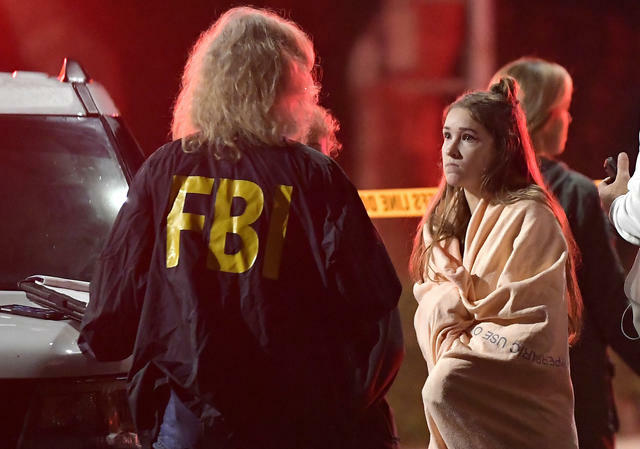 A gunman burst into a country dance bar in Thousand Oaks late Wednesday and opened fire, killing at least 12 people including a sheriff's sergeant, the authorities said. "It's a horrific scene in there," Ventura County Sheriff Geoff Dean said during a news conference. "There is blood everywhere." Sgt. 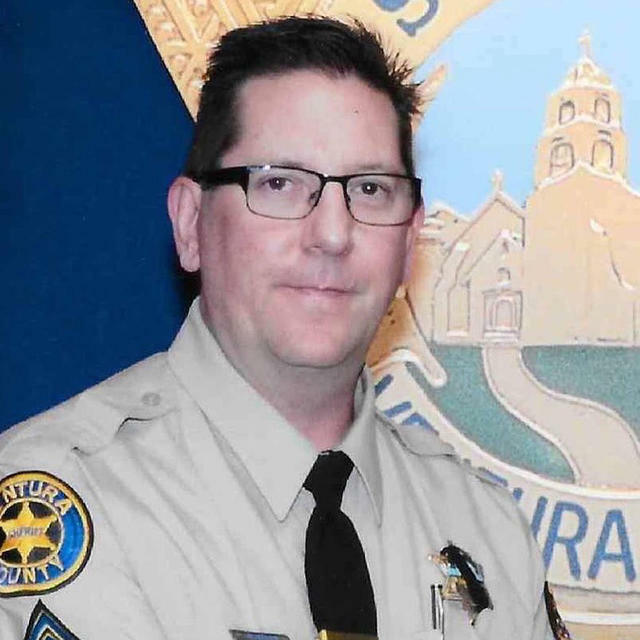 Ron Helus, a 29-year veteran of the department, was killed as he entered the Borderline Bar & Grill to help, officials said. He is survived by his wife and a son. "He died a hero," Dean said through a choked voice, adding, "He went in there to save lives." The suspect, who was not identified, also died. It was unclear how he was killed. At least 10 additional victims were injured during the rampage, officials said. The bar was hosting a weekly college-themed night, open to patrons as young as 18. A witness told the Ventura County Star that the gunman appeared to pick off victims, one by one. "It wasn't really random," he said. "He was shooting people up close." Read the latest at the Ventura County Star and L.A. Times. 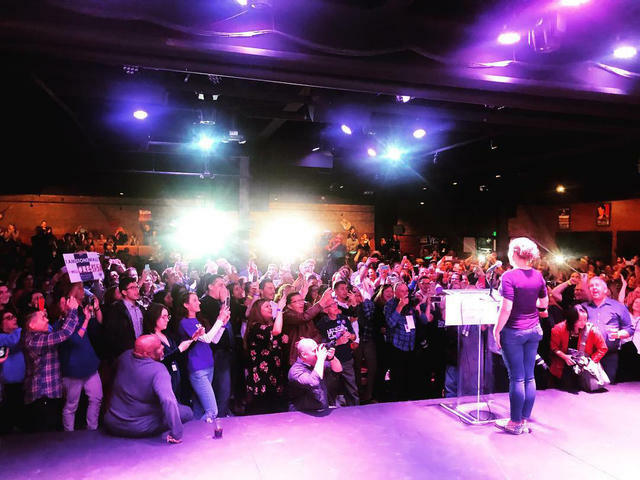 Katie Hill's campaign captivated millennials. Two G.O.P. House seats fell to Democrats in Southern California, as Katie Hill ousted incumbent Rep. Steve Knight, and Mike Levin clinched the seat of outgoing Rep. Darrell Issa. Hill now becomes the first Democrat in a quarter-century to represent her district, and the first woman — ever. At 31, she'll also be among the youngest members of Congress. 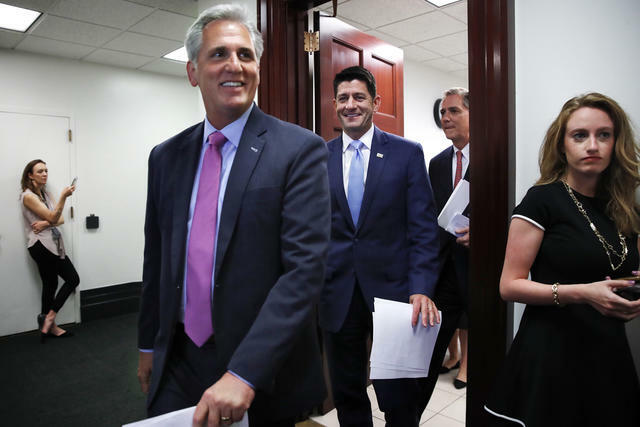 Rep. Kevin McCarthy, with House Speaker Paul Ryan, was expected to win the minority leader post. After the Democratic takeover of the House, Republican Rep. Kevin McCarthy of Bakersfield wasted no time in launching a bid for minority leader. He'll have to fend off a challenge from the right by conservative hard-liner Rep. Jim Jordan of Ohio. "We should not let last night’s results diminish the great gains President Trump and our majority have delivered," McCarthy said. Rep. Adam Schiff is eager to investigate President Trump. 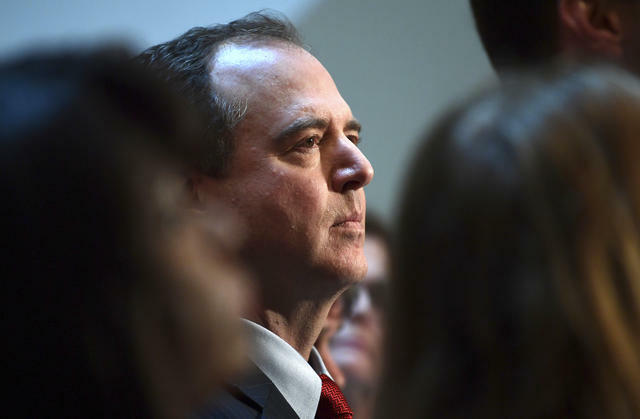 When Congress reconvenes, Rep. Adam Schiff is expected to lead the crucial House Intelligence Committee, replacing Trump loyalist Rep. Devin Nunes. The Burbank congressman has vowed to investigate the presidency the way the G.O.P. never did. “We’ve had a Congress completely unwilling to do its job, to be a co-equal branch of government, unwilling to push back against the basic indecency of this person in the Oval Office,” he said. So is it goodbye to changing clocks twice a year? Not quite. Californians overwhelmingly approved a move to adopt daylight saving time yearround, but some big hurdles remain. The change requires two-thirds approval from the state Legislature, a signature from the governor, and one more signoff — from Congress. A similar effort that began earlier this year in Florida found the federal body less than eager to take it up. Maps breaking the election vote down by county highlighted California's urban-rural divide. 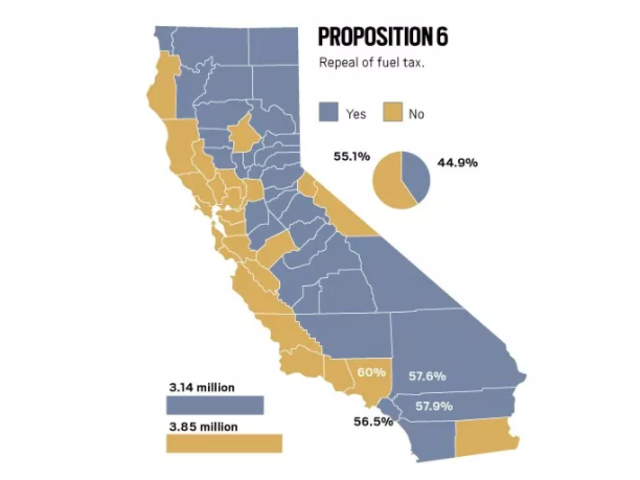 Los Angeles and the Bay Area, for example, heavily favored keeping the gas tax increase. The Central Valley: not so much. 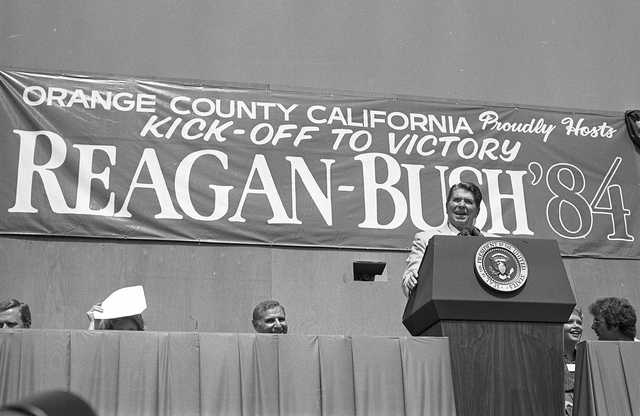 President Reagan spoke at campaign rally in Orange County in 1984. L.A. Times columnist Gustavo Arellano wrote an obituary for the old Orange County. The once reliably red county that President Reagan described as the place "all the good Republicans go to die" has been replaced by a diverse region with "politics more purple than Barney the dinosaur." Eleni Kounalakis, a former ambassador to Hungary under President Obama, became the first woman to be elected as California's lieutenant governor. Among the other statewide victors — all Democrats — Attorney General Xavier Becerra, Secretary of State Alex Padilla, and Controller Betty Yee were returned to office. Residents in Long Beach have become so fed up with what they say is a criminal element among the homeless that they're doing citizen patrols of encampments. The police support the effort, but critics say it smacks of vigilantism. "What changed for me is the safety of our homes and our families is now in question," an organizer said. "We want to let them know we’re here, we’re compassionate, but we’re also angry." 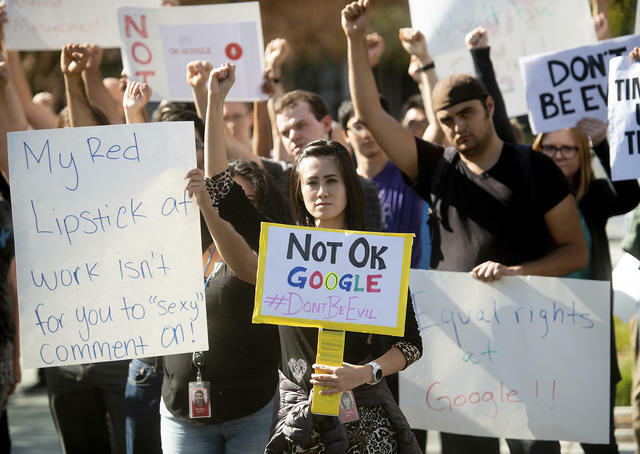 Workers protested against Google's handling of sexual misconduct allegations in Mountain View last week. N.Y. Times columnist Farhad Manjoo said that the Google walkout last week was a watershed moment, not just for the search giant but for all of Silicon Valley. "We’re assembled now," an employee told him. "We have an incredibly engaged group of people, and we aren’t going to stop escalating this." A rendering of a wild new skyscraper planned for Downtown Los Angeles. 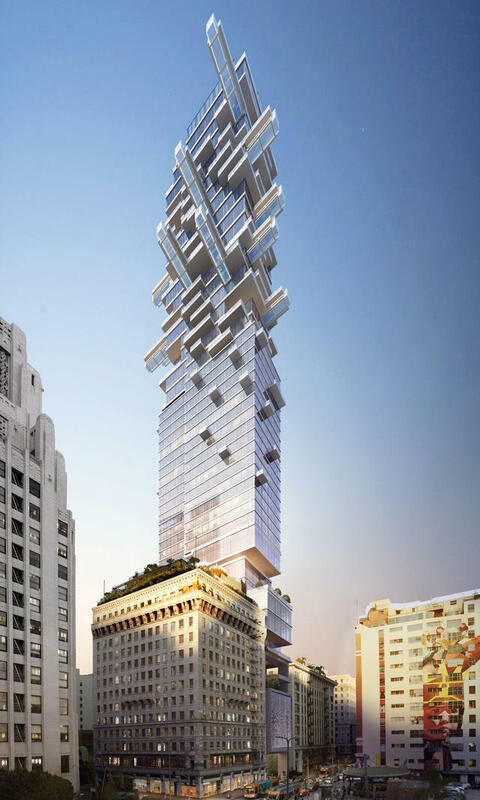 A developer wants to build a 53-story tower in downtown Los Angeles that look like a Jenga stack, mid-game. The design calls for terraces and glass-bottom swimming pools that jut out from multiple sides of the building, including some that would hover above a popular rooftop bar. In Los Angeles, you're never successful enough, never pretty enough. Perhaps that's why self-help has become a pathological pursuit. A writer spent a month inside the city's "cult of betterness" and found a unifying thread among its practitioners: They are all searching for meaning and purpose. A zipper truck moved the divider on the Golden Gate Bridge. A mesmerizing machine known as a zipper truck shifts the lane divider on the Golden Bridge each day to ease congestion. Unveiled in 2015, the $1.4 million truck allows the number of lanes to be changed in either direction to accommodate morning and evening rush hour traffic between San Francisco and the north Bay. They're also pretty fun to watch in action. Southern California survives on imported water. 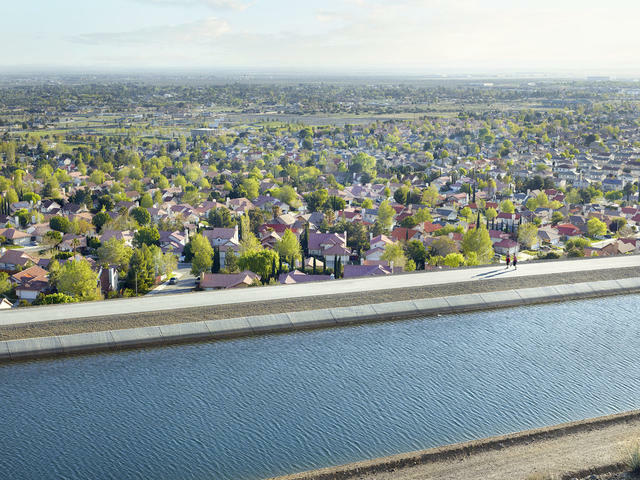 Vast quantities of it arrive via the California Aqueduct, a concrete channel that snakes 444 miles from the Sacramento-San Joaquin Delta into the state's central and southern reaches. Photographer Markku Lahdesmaki set out to chronicle the life drawn to its edges for a fascinating project called "Vein of Life." 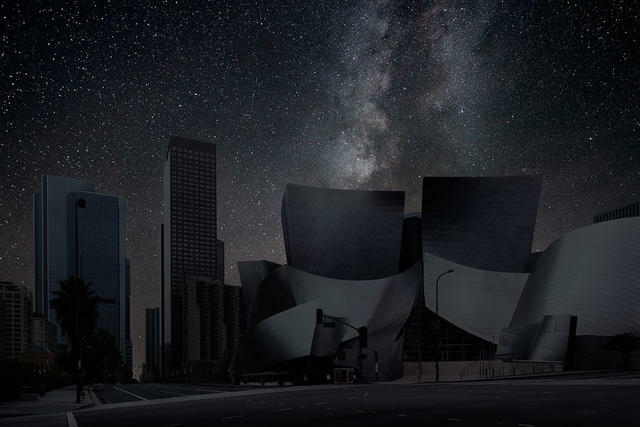 For this composite image, French photographer Thierry Cohen imagined Los Angeles under a darkened sky. After the Northridge earthquake knocked out power in Los Angeles in 1994, some residents called 911 to report a "giant silvery cloud" over the darkened city. Worry not, they were told. It was the Milky Way. By some estimates, artificial light shrouds the stars from a third of the world's population, including millions of inhabitants of vast metropolises like the San Francisco Bay Area and greater Los Angeles. Over the past several years, a number of California cities have moved to adopt "warmer" street lights that cut down on unnecessary glare. In September, Ventura County supervisors voted to impose "dark hours" in the Ojai Valley — from 10 p.m. to sunrise — when homes and business will be required to shut off their outdoor lights. If you are a paying member of the California Sun but have continued to receive appeals to join, please let me know and I'll straighten it out: mike@californiasun.co.